Is that title cheesy, or what?! This post (or rather, this dessert) is chock-full of coconut. As you know, I am looking for ways to use up my left over ingredients from the past couple of months. I already used the graham crackers in the Chocolate Cream Pie, and now the coconut is gone with these Black-Bottom Coconut Bars. These bars were found on another blog, called Bake or Break. 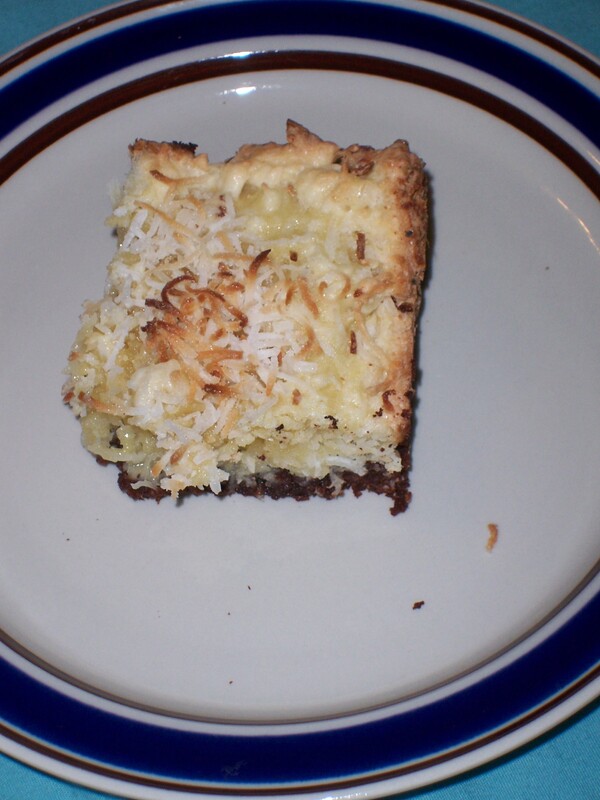 I had most of a 14-ounce bag of coconut, and the recipe called for 7 ounces, so I used some coconut in the brownie part and I sprinkled a lot on top. I haven’t tasted them yet, I tried them, and but hopefully the coconut is not over powering. The brownie part really comes through. 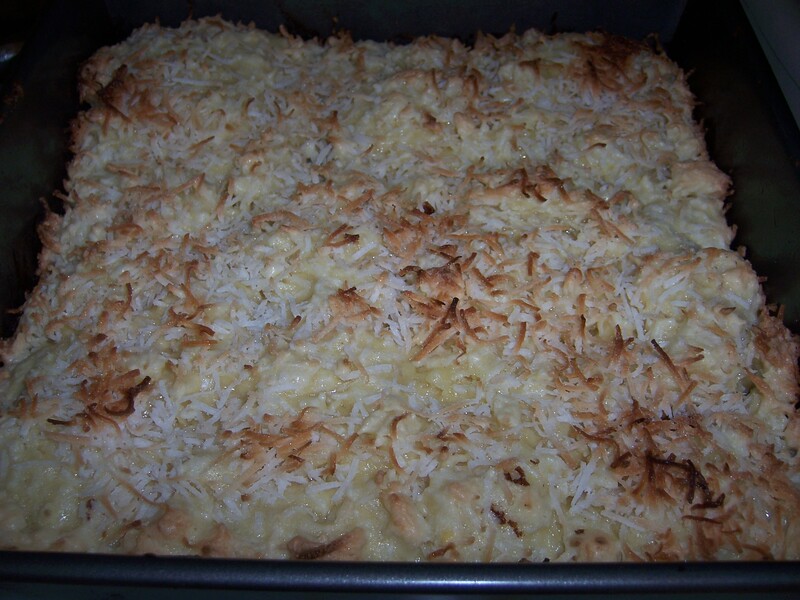 (Sorry to those of you who are not coconut fans, maybe you’ll like my next dessert better!) Also, these were rather easy to make. I know, I say that for EVERYTHING, But this time I really mean it. No special equipment. No electric mixers necessary. It is really just whisk everything together and pour/press into the baking dish. Okay, so you have to melt the butter-in the MICROWAVE. Seriously, I think this is the quickest, easiest dessert I’ve made in a while. Preheat oven to 375°. Line a 9-inch square baking pan with aluminum foil, leaving an overhang. Butter bottom and sides of foil. Using a microwave-safe bowl, melt butter in microwave. Whisk in sugar and salt. Whisk in egg, then cocoa and flour. Mix until smooth. Spread evenly in prepared pan. Bake for 10-15 minutes. The sides should be beginning to pull away from the sides of the pan. Set aside to cool. Whisk eggs with sugar and vanilla. Mix in flour and coconut. Drop mounds of topping onto chocolate base. Spread and press into base with moistened fingers. Sprinkle with 1/2 cup coconut. Bake 25-30 minutes, or until a toothpick inserted in the center comes out with moist crumbs attached. Cool completely in pan. Then, remove from pan using aluminum foil overhang. Peel off foil and cut into bars. Store in an airtight container for 3-4 days. This entry was posted in blogs, brownies, chocolate cream pie, coconut, graham crackers, inspiration, links, recipe. Bookmark the permalink.